Is Christianity (as we know it) dying? Soon after I finished The Gnostic Gospels by Dr. Elaine Pagels (1979) — a richly detailed and historical page-turner — I stumbled across a colorful book called A New Christianity for a New World by Bishop John Shelby Spong (2002). 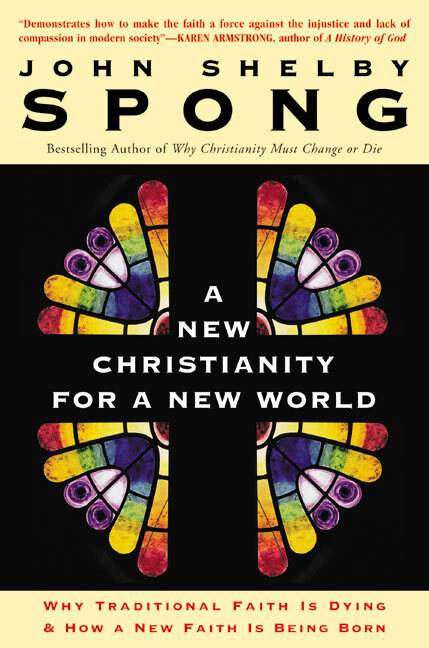 I was familiar with Spong’s reputation for controversy, but I grabbed it up and started in on it right away, somehow thinking it would be lighter in tone and more inspirational in nature. Little did I know that this new book was a dramatic and emotionally significant call to action, asking Christians around the world to put down the outdated, theistic (Father) concept of God and embrace a new vision of the church. Not what you’d consider light reading. In fact, I spent hours re-reading certain sections in an attempt to truly unpack the implications and revelations contained inside the words. This is a book I wish I had discovered much earlier, as it has illuminated for me the necessary steps I must take as an individual in honoring the death of the theistic God — thanking “Him” for his service, and putting him to rest once and for all. It also shows me that there is still much work to do in lovingly and respectfully engaging in open dialogue with Christians who are seemingly uninformed about the history of their own Orthodox Church and also in rehabilitating those Christians in exile — who have become disillusioned with their faith as they, as individuals, have changed and grown so much, only to see their creeds and institutions (once viewed as a reliable bedrock) become insufficient, small-minded and small-hearted. What was exciting for me, and divinely-timed, was that the book also offers a framework of not only Spong’s call for reformation and a new “Ecclesia” (Greek for “assembly” or “those called out”), but references the writings on “Creation Spirituality” by Rev. Dr. Matthew Fox and the picture of the historical Jesus drawn by the work of John Dominic Crossan. This framework examines the life of Jesus, the teachings of The Christ and the gospel of the resurrected Christ Jesus in a truly integral way. For those that identify as practicing Christians and those that have been frustrated with the bloody and barbaric rhetoric hurled from the pulpit, reading this book may very well cause you to walk out of your home church once and for all. For church leaders, reading this book should be required. It could very well start significant changes within the organization — baby steps to be brought up at the next board meeting — and at the very least, it has the potential to create conversation. Most likely, though, it will be met with scorn and indifference by the institution we now know as the Christian church. And therein lies both the problem and the thesis of this book. It breaks down like this, the teachings of the historical Jesus (shared eating, charity, compassion, indiscriminate love for humanity, a direct communion with God as the source of Being), have been taken out of context or ignored outright by the orthodox Christian church we know today. The orthodox church opts instead to teach conditional ideas like salvation (most times only through the Christ figure, or the church itself), baptism (primarily to cleanse one from Original Sin), reinforces the concept of a wrathful Father God (the punitive parent demanding a blood sacrifice), as well as presents a distorted or inaccurate version of natural history as historical fact. e’ve hit a glass ceiling. We’re stalled on the interstate without a map. And the map has yet to be drawn. We’re told that each institutionalized religion is the only path to salvation, righteousness, prosperity, truth, wisdom, peace, etc. ad nauseum. But when we start to personally unfold into new stages of growth (within and without), when we start to become a more mature version of ourselves, we sometimes find that our religion doesn’t provide a mature form of spirituality. It’s like having an appliance crap out on you the day after your 5-year warranty expires. ERROR: We apologize, we are no longer offering support (technical, emotional, or spiritual) for versions 5.X (and above) of the “Your Self” hardware. If you’d like to be notified when this support becomes available, join the club. Religion itself suffers from a form of philosophical retardation, permanently stunted at a level of adolescence, unable to position itself in relationship to others – unable to take second- and third-person perspectives. Everybody is born at square one. There will always be people at [all stages of consciousness] and that is fine. An enlightened society would always make room for that by recognizing that stages in development are also stations in life. And somebody can stop at any of those stations (of Spirit’s own unfolding) and they deserve honor and respect at whatever station they are at. But the earlier stations — archaic to magic to mythic — involve stages that, nonetheless, are ones that humanity’s leading edge passed through in its infancy, childhood, and adolescence. But because religion alone is the repository of the myths created during those times, religion alone is the institution in today’s world that gives legitimacy to those earlier stages and stations for men and women. And religion alone owns that 70% of the world’s population at those stages. All of which is good and beautiful. But precisely because of its ownership of the pre-rational heritage of humanity (and the pre-rational corpus of the great myths), religion alone can help its followers move from the pre-rational, mythic-membership, ethnocentric version of its message to the rational, worldcentric versions of its own message. … This, surely, is the great role for religion in the modern and postmodern world. If “religion” continues to be defined as the tactile and social side of spirituality — rooted in dogma, doctrine and myth — and as long as those myths continue to be told (and interpreted) from magic and pre-rational levels of development, there will be no forms of religion at the higher stages (rational, collaborative or pluralistic). All interfaith dialogue will hit a dead end, religious fundamentalism will remain the status quo, holy wars will continue to be waged, and we will continue to seek (to sometimes extreme ends) that which we already are and have always been. UPDATE: Some of the Abrahamic traditions (Christianity, Judaism and Islam) do have maps of the higher stages provided by Christian Mysticism, Kabbalah and Sufism, respectively. But, they are for the most part denied or attacked by the institutional and patriarchal forms of these religions. Yes, new myths need to be written from these higher stages of unfolding. New stories need to be told from a level of consciousness that includes the highest number of perspectives. But more importantly, current mythology and doctrine needs to be interpreted, understood and possibly re-cast from these higher stages. That is what will shatter the glass ceiling.